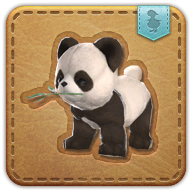 Summon your panda cub minion. Untrained in arts both martial and magical, but as scrumptiously adorable as chicken glazed in a tangy orange reduction. So popular are pandas in the Far East, that there are tales of the creatures being promoted to powerful positions within local governmental agencies. This particular mechanical reproduction is thought to have been brought to Eorzea by a Doman wise man.